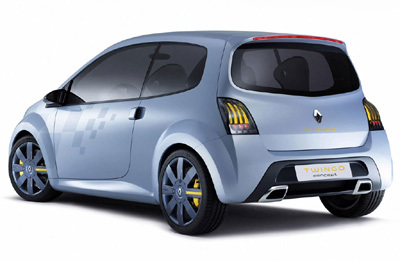 The Renault Twingo concept from the 2006 Paris Motor Show was a continuation of the Twingo city car which has been around since 1993. 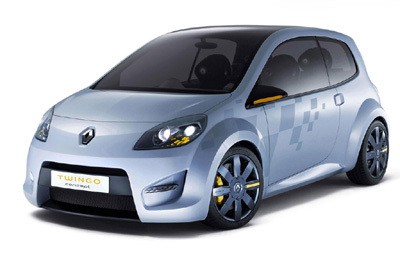 The 2006 Twingo concept, due to go into production in 2007, is an entirely new car with far more chiseled styling. The original car had a more 'friendly' and soft appearance when compared to the new Twingo. The Renault Twingo concept is powered by a low emmision 1.2-litre turbocharged 4 cylinder delivering a maximum of of 100hp at 5,500rpm and 145Nm of torque at 3,000rpm. 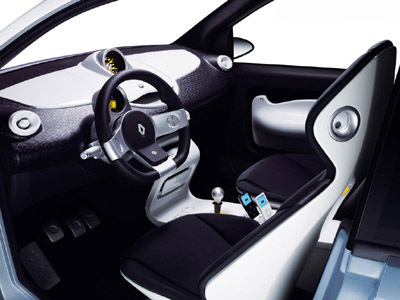 Inside the Twingo concept Renault have installed media conectivity devices like USB ports and docking stations for the Apple iPod and Nokia Smartphone. For added interest the concept is fitted with a music mixing deck intended to influence the younger buyer, a market in which the Twingo sits nicely. The Renault Twingo concept holds its four occupants in bucket seats with integrated headrests and individual jack plugs so everyone can listen to their favorite music in private.